The picture at the top of this entry is the installer Dustin busting his nuts blowing in insulation in the teensy-tiny section of my split-level’s attic. When he came back out he was COVERED in the cellulose insulation – the guy really went after it. The blow-in from the outside of the house (holes drilled through the walls) took a couple of days and he did a SUPERB job. Can’t say enough good about the work. The HVAC system and hot water heater were done by Cooper Heating and Cooling. Every single person I dealt with was polite, professional and knowledgeable. The salesman, Jim Reynolds was completely versed in the Climate Smart program, had all the paperwork straight and the install went 1-2-3 by the numbers. The new unit works flawlessly and I’m thrilled to death. I’d tell you about the experience I had with the windows (Accent) but suffice to say I was less than pleased and let it go at that. Hey Doug. Thanks a ton for the write-up about our insulation guy (It’s Dustin, btw). It’s really nice to be acknowledged for the work these guys do. They work hard day in and day out to make every one of these jobs look professionally done, and sometimes they get into some really tight spots where others might say, “aw the heck with it, that’s close enough”. Can’t wait to show these guys your comments! Larry Meeks, Pres. 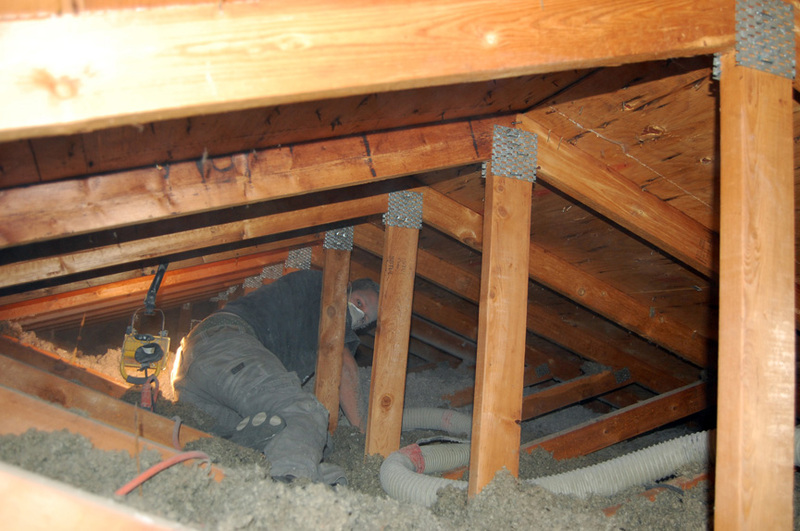 Thermal Craft Insulation Co.
Larry, I’m always pleased to recognize hard-working craftsmen! These are the people that make our world what it is. I was really impressed with his attitude too – not one word of complaint or attitude about the difficulty! He just got up there and went at it with a smile on his face. You must treat ’em right! High marks all around!